Most mornings commence in a similar pattern... awake with only the morning sun through the hatch as an alarm, prepare a pot of deep brown coffee with the french press (no electric coffee maker available, of course), relax in the cockpit sipping the dark brew and take in the surroundings. Sometimes there is a cooling breeze while the sun remains low in the sky, other times the heat and humidity blanket is felt immediately having never quite lifted during the night, at other times there is a passing shower or thunderhead. Ahhhh.... exhale. Most mornings but not all... sometimes prohibitive conditions make even preparing coffee impossible (more to come on this below). I love the mornings at anchor. Coffee, some reading, writing, a swim, bathing in the salt water. 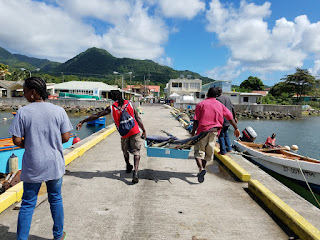 Although our initial landing in the Caribbean after the off shore from Bermuda was the lovely island of Antigua, this blog chapter begins with the beautiful island of Dominica (accent on third syllable), or Dominique as also called due to her French history, or Wai'tu Kubuli (which means "tall is her body"). 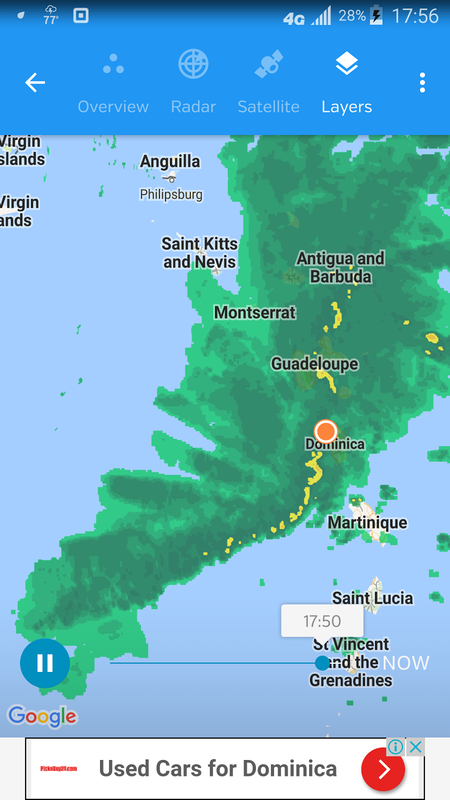 Dominica should not be confused with the much larger country of Dominican Republic 400nm to the northwest. Dominica is rugged and dramatic. Her mountainous composition forces a ripple in the easterly trade winds. As the warm air is forced up along the mountain sides, the higher altitudes form frequent clouds and brief but intense rainstorms. The regular rainfall and unspoiled landscape give rise to seemingly endless rain forests as well as hundreds of rivers. Dominica has many hot springs and the world's second larges boiling lake (which was unfortunately closed to visitors currently) as well as many rare bird and plant species. It is a nature lover's paradise. Our sail to Dominica directly from Antigua consisted of 100nm initially at about 190 degrees then shifting to 160 degrees as we passed Guadeloupe off to port. We decided to tackle our first Caribbean hop rather aggressively by departing Antigua one Friday afternoon in late November, sailing overnight largely in the lee of Guadeloupe, arriving in Prince Rupert Bay Portsmouth, Dominica at daybreak Saturday. The initial leg between Antigua and Guadeloupe was choppy and we were surprised that our normally strong stomachs were not feeling so well. 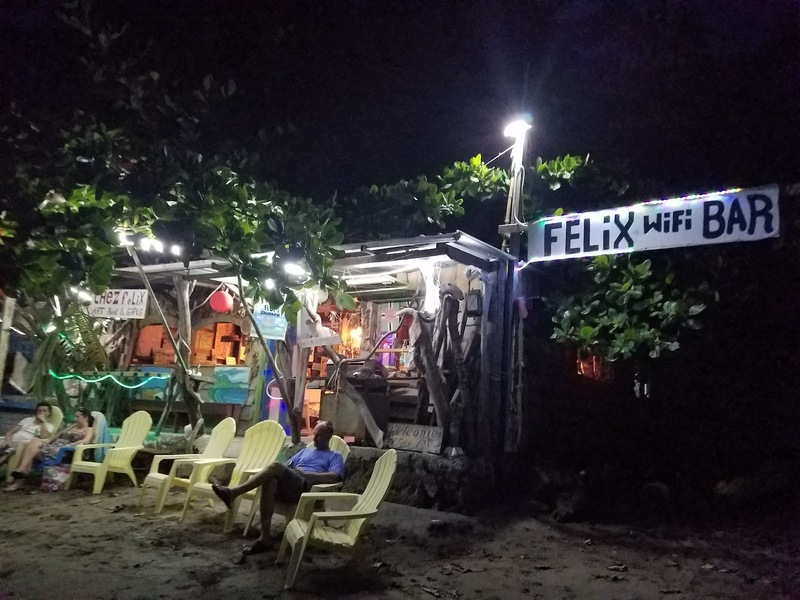 At about 0200 in the dark of night we were asking ourselves why we ever decided to make our first Caribbean run a long overnighter as we counted down the hours to daybreak. (Most Caribbean island sailing consists of 10-40nm hops from harbor to harbor or island to island.) This was a difficult sail for much of the passage and we welcomed the approach to Dominica at first light. The sail from English Harbor Antigua to Prince Rupert Bay Dominica was fast - 100nm in less than 15 hours, but also difficult much of the way. The open waters between Antigua and Guadeloupe were choppy, then we experienced the variable winds created by the mountains of Guadeloupe off to our port causing swift wind shifts and, as the night progressed, frequent squalls with bursts of 30 kt winds. This sailing leg felt more like an off shore passages than a leisurely island hop. We decided after this passage that we will stick to shorter day trips and harbor jumping for a while. European colonization of Dominica happened later than with most of the other islands in this region of the world, perhaps initially being considered too rugged to be of interest. French eventually inhabited the island in the late 1600's hence the continued common creole cuisine and sprinkling of french language. The British eventually took over in the late 1700's and, having abolished slavery in all their territories (except India) in the 1830's, Dominica became an island of refuse for many slaves from neighboring islands in the 1800's. Dominica is the most mountainous of all the islands in the expansive Lesser Antilles range. Much of its nearly 300 square miles is a protected natural park including extensive rain forests and mountains. Dominica has many waterfalls and hot springs and a whopping 365 rivers! There are few predator species on the island and no large mammals. 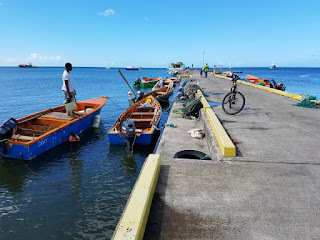 Until fairly recently, Dominica had a surly reputation with cruisers due to crime and pollution throughout the two main harbor cities (north in Portsmouth and south in Roseau). Several years ago, however, an organization was formed called PAYS (Portsmouth Association of Yacht Services) to provide security as well as tours, local information, and other services to visiting yachts. Working with one of the many "PAYS certified" Dominicans proved to ensure we had a fantastic stay. One of the several PAYS boats that provide security, tours and overall great support for visiting cruisers. It has become part of our routine upon setting anchor to snorkel to check the placement. The clear waters allow for great visibility and assurance that the anchor is holding well and there are not nearby risks to fouling. Customs procedures is different for every country. The cruising guidebook provides some helpful information as does noonsite.com. For Dominica, the customs office is closed on weekends thus our Saturday arrival required me to go to the home of someone who acts as a contractor for the customs official. (But I did not know this at the time.) A PAYS guide (who I had just met 2 minutes prior and was pretty sure he was legit) wisked me away quickly from Argon towards the south side of the bay and walked me through some intimidating gates, down a deserted broken concrete passage way, to a weathered concrete building with no obvious activity around. (I kept telling myself "I can trust these PAYS guys" but I admit I was a tad uncomfortable). I was brought up to the second floor of an apartment building when my PAYS friend knocked on its door several times, obviously waking up whoever was inside on this early Saturday morning, and then told me to wait a few minutes while he went off. Eventually a sleepy eyed, friendly young man gave me papers to complete outside his apartment door on a table with toys, then I was summoned inside to the one room apartment where he checked Argon's documentation, our passports, and I paid him. Whoops.... he needed cash and I did not have enough EC on hand! But by this time my PAYS friend, Daniel, had returned and he lent me the needed money! All was well and I felt ridiculous for ever feeling uneasy. 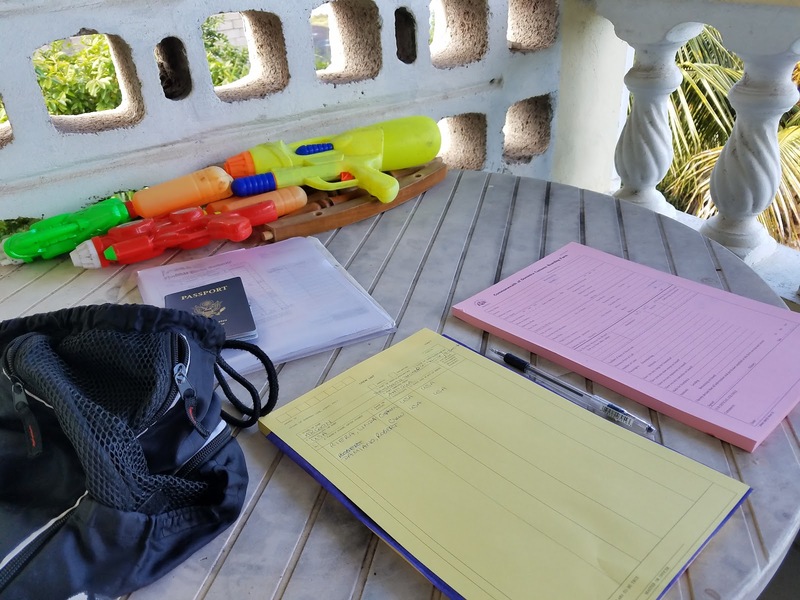 Unconventional, weekend version of the customs office for check in clearance. Although strange and initially disconcerting to be lead to a back roads concrete residential building, it was ultimately fairly easy. Dominica also does not require a separate checkout upon departure for short stays, which is very convenient. 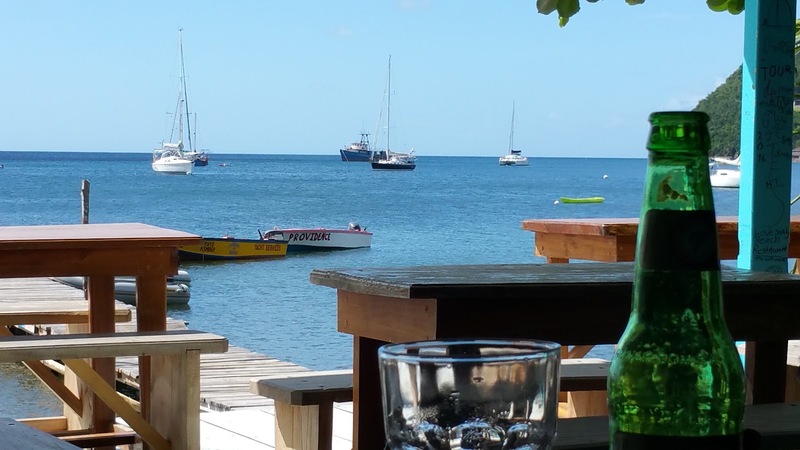 We found Dominica quite intriguing and fantastic on land (not so much on the water... see further below). 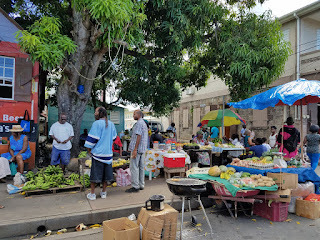 Portsmouth is the town on Prince Rupert Bay and the second largest city in Dominica, next to the capital of Roseau at the southern end of the island. There is a mixture of French and English spoken (the local dialect can be challenging to understand for my naive ears, even when English is being spoken) and the currency is the Eastern Caribbean dollar (about 2.7EC to 1USD). People were extremely friendly and seemed to welcome cruisers. The buildings are seemingly haphazard; amenities and commodities are very rudimentary. This is clearly third world lacking any sign of abundance except for the never ending fresh fruit. Open local produce market along the main strip in Portsmouth. I initially was accidentally offended a couple of vendors when I tried to negotiate on the price. Whoops. I soon learned that this was not the way here and I felt a tad ashamed. 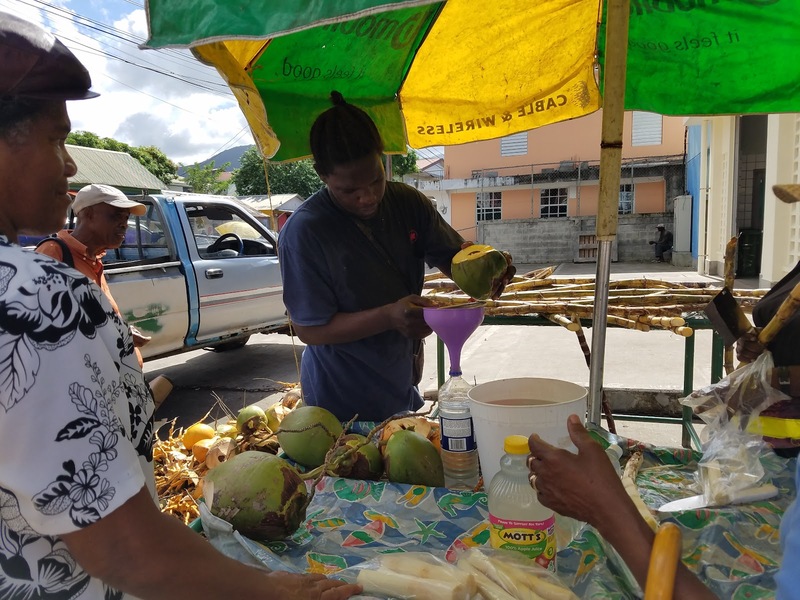 Fresh coconut milk being poured in the market. Dozens of small, simple fishing boats bring their daily catch to the main concrete dock in Portsmouth. Alexis, one of the PAYS guys, guided us up the enchanting Indian River. Scenes from Pirates of the Caribbean II were shot here. Alexis from PAYS arranged for Robert (aka Bob) to take us to explore the Syndicate rain forest and waterfall. Robert was a complete joy to spend the day with sharing his knowledge and experiences. 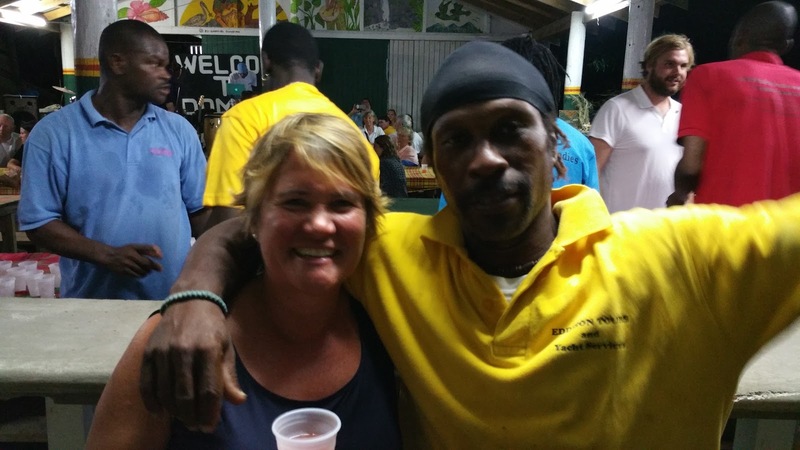 Dominica has strict requirements for their certified tour guides who must be very knowledgeable about the island's history and plant & animal species. The Syndicate rain forest is part of Morne Diabolitin National Park and is filled with the gigantic Gommier trees (dacryodes excelsa). Enjoying freshly picked and peeled grapefruit along the path. Robert also found and gathered cinnamon, sage, basil, lemon grass and thyme. We were able to use the spices in our cooking on the boat during the following days. Yes, we really swung on long vines across a river! In addition to the beauty of the rain forest, it was surprisingly serene. Only two other hikers were passed over several hours as we made our way eventually to a waterfall. Restaurant options with good local food seemed to be scarce perhaps partially due to it being a bit prior to the real tourist season. But we experienced some eclectic places. 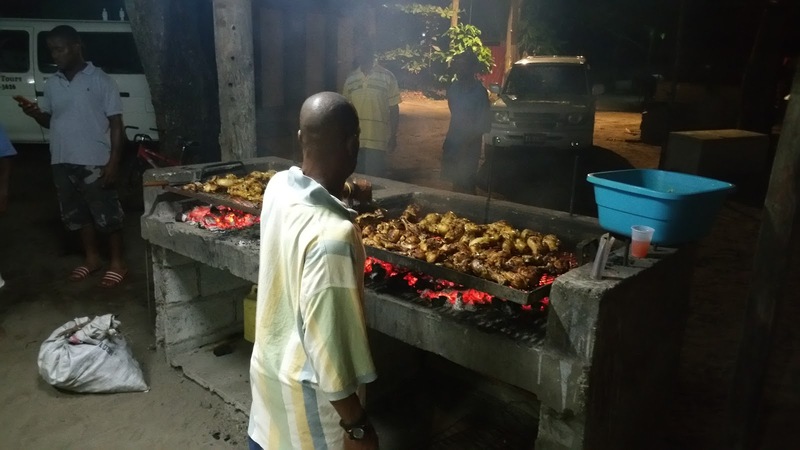 We joined the PAYS sponsored beach BBQ Sunday night with grilled fish and chicken and very strong rum punch along with a reggae band. My PAYS friend, Daniel. Daniel helped me with the unconventional customs check in upon arrive our first morning. Very funky beach bar and WiFi by Felix who also displays his beautiful art inside. View of Argon anchored in the distance across a calm Prince Rupert Bay with a bottle of Presidente beer in the foreground from Sandy's beach bar. Unbeknownst to us, this calm water would soon be changing. Experimenting muddling various local fresh fruits for some yummy beverages on board. Yes, there was rum in addition to the club soda! The initially serene anchorage became very uncomfortable as some weather far off to the southwest produced some waves that rolled easily into Prince Rupert Bay. The two and a half mile wide bay opening offers no protection from seas with a westerly component. The relatively constant trade winds had the boats pointing mostly south-east which put these rollers on our sides causing some pretty dramatic rolling side to side. After a sleepless night and no sign of the conditions easing up, we decided to deploy a stern anchor using our Fortress 23 (which is perhaps one size too big for this purpose but manageable with the dinghy) to keep us somewhat pointing into these waves. The stern anchor helped a bit, however, when a squall would come through with an associated burst of high winds from a different direction, our stern anchor either held us parallel to the rollers not allowing us to swing with the changing winds, or other boats would swing too close to us and we needed to redeploy. This two and a half minute video shows a bit of the conditions leading us to deploy the stern anchor in an attempt to keep Argon perpendicular to the rollers. Needless to say, no relaxing morning coffee in the cockpit! Conditions "improved?" when we moved to the southern part of the harbor but not enough for us to stick around. Along with a handful of other boats, we decided to move to the southern part of the large harbor which seemed like it might offer some protection from the rollers, however, we would be outside the protection zone of our PAYS friends. At first, we got some relief from the rolling but we continued to experience squalls. In addition, we were unsure if it was safe to leave the boat unattended in this part of the harbor which is out of range of PAYS oversight. Later, the rollers started coming in from slightly more north and this part of the harbor no longer provided any protection from them. 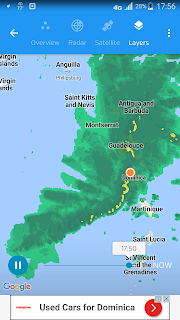 After two days of these rolling conditions, we reluctantly cut our time in Dominica short, hauled anchor, and set sail for the french islands of Les Saintes 24nm north which would offer more protection. 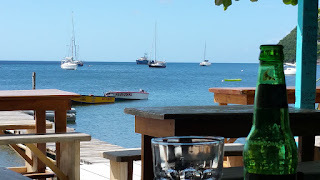 Although we were disappointed to limit our time in Dominica to less than four days, we were to soon be anchoring in an unexpectedly gorgeous and relaxing harbor off Terre-de-Haut, part of the french islands of Les Saintes. Dominica was our southern most stop on this journey; we now begin leisurely exploration and island hoping northward for the next few months.